www.inspiration.com/ipad Retail Price: Inspiration Full Version—$14.99. Inspiration Lite—Free. 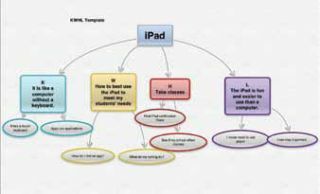 Quality and Effectiveness: Inspiration Maps for the iPad allows students and educators to easily create concept maps and graphic organizers. The beauty of the app is its intuitive capabilities. You can create a map with more than 26 built in templates. Ease of Use: The organizers are pre-made for the student and teacher. There are templates for just about every subject. Thinking maps are extremely helpful for students who need a visual graph to comprehend cause and effect and compare and contrast. Creative Use of Technology: Inspiration Maps allows you to import pictures, add notes, change colors, and add hyperlinks. You can easily convert diagrams into outlines. All diagrams are saved, or you can send your diagrams to Dropbox or iTunes. Diagrams can be saved in saved as images or sent via email. Suitability for Use in a School Environment: This app is perfect for the school environment, from administrative meetings to teaching students how to take notes. The graphic organizers make beautiful displays for presentations. • Teaches students how to take notes. • A great visual tool that uses color coding, images, and notes to clarify difficult material. • Can be used in the one-iPad classroom. OVERALL RATING: This is a must-have app for all classrooms. Taking notes and learning to extract the significant points in English, Social Studies, and Science is difficult for most students. Here is an app that gives you the template for you to fill in.